Boulard Calvados is the first name in super-premium Calvados, the celebrated apple-based spirit unique to the Normandy region of France. Boulard was Founded in the late 1820s by Pierre-August Boulard. Boulard's time-honored reputation begins in the firm's 150 acres of orchards and 35,000 apple trees in the Pays d'Auge district, the officially designated source of the finest apples in Normandy. Over 120 varieties of apple, from 800 varieties grown in Boulard's orchards, are selected for production of Boulard Calvados (over twice the number of varieties stipulated by the governing body regulating Calvados production). 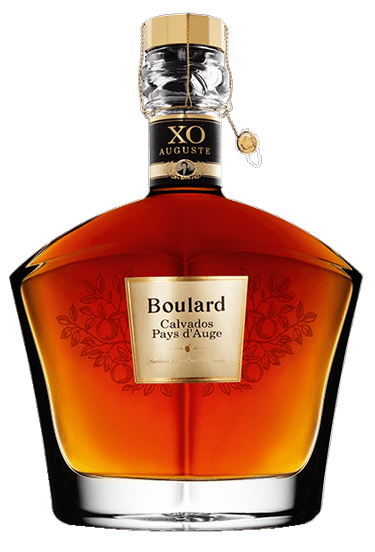 Boulard Extra is crafted by marrying only the oldest and most elegant vintages of Boulard Calvados' special reserves. NoseA delicate nose, light and impeccably refines, rich aromas, with a generous bouquet of ripe fruit and sweet apple. PalateA full, but sweet opening lead to an explosion of intense, fruity flavors. Smooth, round flavor with hints of caramel. Calvados Boulard VSOP is the culmination of blending different Calvados Pays d'Auge from 4 to 10 years old.